Moving to the next shadow area on this painting, we will use the same "charging" technique that we used yesterday, except that the last application will just be water. This time we will work from the bottom edge of the shadow toward the bowl. Turn your paper upside down if that is easier to maneuver with your brush. Again work from the blue (French Ultramarine Blue) to reds (Permanent Alizarin Crimson and Winsor Red) to yellow (New Gamboge), then use clean water and pull the water INTO the pigment. If you pull the pigment INTO the water, you will just keep pulling out the pigment, diluting it and creating a harsh line. 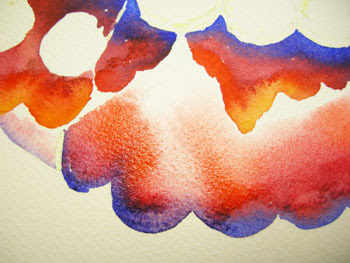 If you push water INTO the pigment, you will have a clean transition from white paper to clean color. Allow this to dry.